Poster board is used for everything from school projects to family tree creation and simple signs for events. This durable, thick material is sold in both single sheets and multi-packs in assorted colors. If working on a special project, you may need to know the dimensions of this card-like material up front. Basic, standard poster board is 22 inches high, 28 inches wide, and it may be glossier on one side than the other. It is sold in shades from white to black and numerous colors in between, even fluorescent shades. An office-supply store or craft shop may offer variations, such as tri-fold poster board measuring 36 inches high, 48 inches wide when opened, or 24 inches wide when closed. 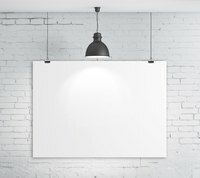 This type of board is useful for free-standing presentations where wall space or an easel is not available.